Cecil Stanley Samuel Hibbert’s birth was recorded on 24th February 1893 at Pt Nepean. He was the sixth of eight children of George and Mary Sophia Hibbert (nee Lyons). George Hibbert was the proprietor of the Lemonade Factory in Sorrento. Cecil enlisted on 15th July 1915 into the 22nd Infantry Battalion, 6th Reinforcements. Eldest brother Frank, was in the Naval Reserve and was called up three days before the start of the war. He re-enlisted on the same day as Cecil into 30th Infantry Battalion and was attached to 5th Division AIF Headquarters in May 1916 and remained there until returning to Australia in 1918. His older brother Albert (26yrs) had enlisted three days earlier into 31st Infantry Battalion. (See his story HERE). Their youngest brother James, who being 18yrs and 1 month required parental consent, enlisted on 1st June 1916 into 3/2nd Cyclist Battalion later moving to 5th, 21st then 24th Infantry Battalion. So in June 2016 George and Mary Hibbert had four sons and a son in law serving in the A.I.F. The 22nd Infantry Battalion, 6th Reinforcements embarked from Melbourne on H.M.A.T. A38 “Ulysses” on the 27th October 1915. In England, on 24th February 1916 Charles was transferred to 7th Australian Infantry Battalion in France. The 7th Battalion was among the first infantry units raised for the AIF during the First World War. Like the 5th, 6th and 8th Battalions, it was recruited from Victoria and, together with these battalions, formed the 2nd Brigade. The battalion was raised by Lieutenant Colonel H. E. “Pompey” Elliott within a fortnight of the declaration of war in August 1914 and embarked just two months later. After a brief stop in Albany, Western Australia, the battalion proceeded to Egypt, arriving on 2 December. It later took part in the ANZAC landing on 25 April 1915, as part of the second wave. Ten days after the landing, the 2nd Brigade was transferred from ANZAC to Cape Helles to help in the attack on the village of Krithia. The attack captured little ground but cost the brigade almost a third of its strength. The Victorian battalions returned to ANZAC to help defend the beachhead, and in August the 2nd Brigade fought at the battle of Lone Pine. While holding positions captured by the 1st Brigade, four members of the 7th Battalion, Corporal A. S. Burton, Acting Corporal W. Dunstan, Lieutenant W. Symons and Captain F. H. Tubb, earned the Victoria Cross – Burton posthumously. The battalion served at ANZAC until the evacuation in December. After the withdrawal from Gallipoli in December 1915, the battalion returned to Egypt. In March 1916, it sailed for France and the Western Front and entered the front line trenches for the first time on 3 May. The battalion’s first major action in France was at Pozieres in the Somme valley where it fought between 23-27 July and 15-21 August. After Pozieres the battalion manned trenches in the Ypres salient in Belgium, before returning to the Somme valley. It saw out the horrendous winter of 1916-1917 rotating between training, working parties and duty in the trenches. In early 1917, the Germans withdrew to the Hindenburg Line and the 7th Battalion participated in the brief advance that followed and then came to a grinding halt before Bullecourt. The battalion was withdrawn from the front line for training on 9 May 1917 and did not return to action until the Ypres offensive of September and October. It fought major battles at Menin Road on 20 September and Broodseinde on 4 October, and then spent much of ensuing winter in the Ypres mud. On 15th-21st August 1916 the 7th Infantry Battalion was involved in action at Pozieres. Cecil was wounded on the 21st with a severe gunshot wound to the left leg and returned to England to recover. After eight months he returned to France and eventually rejoined 7th Battalion on 10th May 1917. Broodseinde was a large operation, involving twelve divisions attacking simultaneously along a 10 kilometre front. In the centre, I and II Anzac Corps, composed of three Australian divisions and the New Zealand Division, went forward side by side capturing the village of Broodseinde. The attack was executed in the same manner as Menin Road and Polygon Wood; The troops’ objectives were only one or two kilometres from the start line and the advance was preceded by a massive artillery bombardment. The infantry then followed a creeping barrage, which was timed to arrive at the German trenches just before the infantry did. Once again concrete pillboxes, such as those captured by the Tasmanian 40th Battalion at Tyne Cot and still visible in the cemetery there, delayed, but did not stop the advance. Map phase 1 (Initial Positions): The British and German front lines before the start of the Battles of Broodseinde and Passchendaele. The 1st and 2nd Australian Corps were ordered to attack on a front to the north of where the 1st Corps had fought during the battles of Menin Road and Polygon Wood. 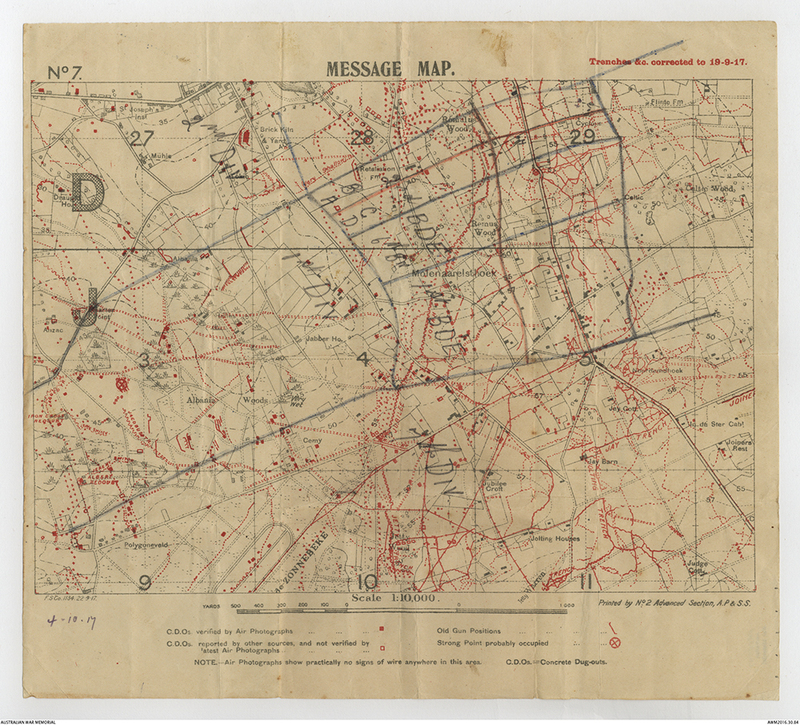 Map phase 2 (British advance): On 4 October the British advanced north-east towards Passchendaele. 1st Australian Corps took Broodseinde, 2nd Corps captured Tyne Cot. the possibility of detection added to the tension, but the night was quiet until shortly before dawn. The difficulties began before zero hour. The German barrage heard by observers at 5.27 fell, as they feared, directly upon the waiting line of I Anzac, hitting the 1st Division more severely than the 2nd, but descending intensely upon both. The most forward battalions suffered least; where there was room, some of the rear lines edged forward to escape the worst of the storm. Most of the men, lying in their shellholes with their waterproof capes drawn over their heads against the rain, simply had to endure it. When a shell burst in an unoccupied shell-hole, it usually did little damage; when it burst in an occupied one, the men there were killed. So severe was the strain upon the I Anzac line that more than one officer in it wondered how his men would act upon the signal to advance. But on the moment when, at 6 o’clock, the tremendous British barrage crashed down, the German barrage stopped as if by clockwork. The troops, as they straightened themselves above their shell-holes, were, as if by a miracle, spared the explosion of German shells in their midst. With the casual manner that marked them in every battle, they lit cigarettes and moved forward. despite its roar, was not comparable in density to those of September 20th and 26th. The ground was wet and the shells raised no dust-cloud, but only smoke and steam. In contrast with the experience of September 20th, on a considerable part of the I Anzac front the Germans fought at most of the pillboxes. Immediately after rolling over the enemy’s foremost wave, the 1st Division received fire from the Molenaarelsthoek pillboxes and from ruins (“Retaliation Farm”) in the centre, as well as a considerable amount of shell-fire. In the 8th Battalion every officer in the left company was hit. Germans were found everywhere, but their pillboxes were quickly outflanked and captured, and the line moved through the stumps of “ Romulus ” and “ Remus ’’ Woods, and the open crater-field, to the line of the first halt, half-way up the slope. For more details on the day’s actions the 7th Battalion Unit Diary for the period is available on the AWM Site HERE – go to Part 1on p.83. The 7th Battalion would have 253 losses (14 Officers, 239 ORs). “The importance of the Battle of Broodseinde, the third consecutive step in this series, has never been fully recognised except by the commanders and forces that took part. For the general public, accustomed to over- or under-emphasis in the press, there was little in the published news to indicate that this blow counted for more than others. But on the actual field both British and Germans were aware that the events of the 4th of October, 1917, were big with possibilities of decision. What happened to Cecil Hibbert? Cecil was injured during the action on the 4th of October and was cleared to the 2nd Canadian Casualty Clearing Station. He died of his wounds the next day. Cecil is buried at Lijssenthoek Military Cemetery about 25kms west of Broodseinde. Thankfully, Cecil was the last of his family to fall. ps: James Hibbert who by this time was with the 21st Infantry Battalion was also wounded at Broodseinde on 4th October. He remained in hospital in France and after a spell in England transferred to the 24th Infantry Battalion on 13th October 1918. He spent the rest of the war in and out of hospital. Returning to Australia in mid 1919.